"Reflejo Dos - Break on Through"
Oil on Canvas 34" x 40"
After completing "Springtime for Hitler and Germany" it was time to complete the remodeling of my studio which meant installing proper lights and painting it inside and out. Finally in April 2009 I was able to start some sketches for a few ideas I had been considering for some time. The first to be sketched onto canvas was "Reflejo Dos / Break on Through". 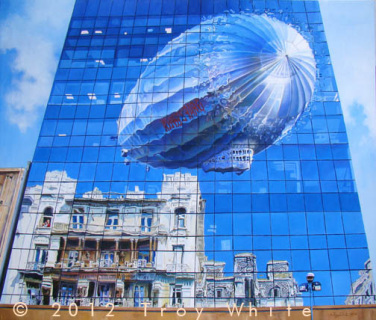 It is a surrealistic project in which the viewer sees the past reflected in a modern glass edifice in downtown Montevideo. The idea came to me when I saw a 100 plus year old building reflected in the Santander Bank building in la Cuidad Vieja on la Aveneda 18 de Julio next to la Plaza del Entrevero. 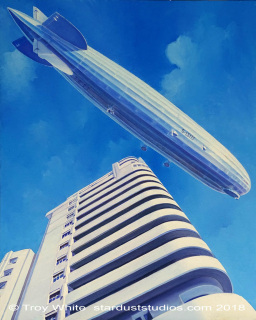 Oil on Canvas 34" x 30"
The Graf Zeppelin's visit to Montevideo in 1934 is well documented photographically. There are many photos of it over the city, Rio de la Plata and alongside Montevideo's most famous building the Palacio Salvo which is located on the corner of the Plaza Independencia. Roughly 650 feet away from Palacio Salvo along Avenida 18 de Julio stands the majestic Palacio Lapido which was completed in 1933. The Palacio Lapido is considered to be one of the finest examples of Art Deco architecture in South America. I decided to paint "Sobre el Palacio Lapido" while working on my surrealistic time warp painting of the Graf Zeppelin "Reflejo Dos - Break on Through", which was completed in 2012. Although no photos exist of the Graf Zeppelin with the Palacio Lapido the Zeppelin was at least 125 feet longer than the distance between the two buildings and would certainly have passed over the Palacio Lapido on it's passage down 18 de Julio. For the painting I decided on a simple, graphic composition that would rotate beautifully and effectively, keeping in mind the travel posters of the 1920s and '30s. "Sobre el Palacio Lapido" is oil on canvas and measures 24" x 30". "Sobre Palacio Lapido" Open Edition Canvas Giclée Print. Image size: 16"x20" During the Graf Zeppelin's visit to Montevideo in 1934 it passed directly over the Palacio Lapido,one of the finest examples of Art Deco architecture in South America.